Spending the day at a Six Flags amusements park may be filled with thrills and fun, but the price of a ticket can be a downer, especially for families. With 16 parks scattered across the U.S., Six Flags offers fun for all ages, from water-themed rides to roller coasters. Adult tickets range from $68.99 to $89.99, but with a little bit of planning, it's easy to get discounts and avoid paying full-price. Here is information for online price discounts and group savings to help you save on your Six Flags tickets for 2019. Source: 2019 ticket prices listed above are from sixflags.com as of 4/17/2019. Children under 2 are free. Prices are subject to change. Check the Six Flags website to verify prices. One of the most popular ways to save on Six Flags park tickets is to use the promo code on an empty can of Coca-Cola brand soda (Coke or Sprite). Be on the lookout: You have to bring the can with you to get the discount. 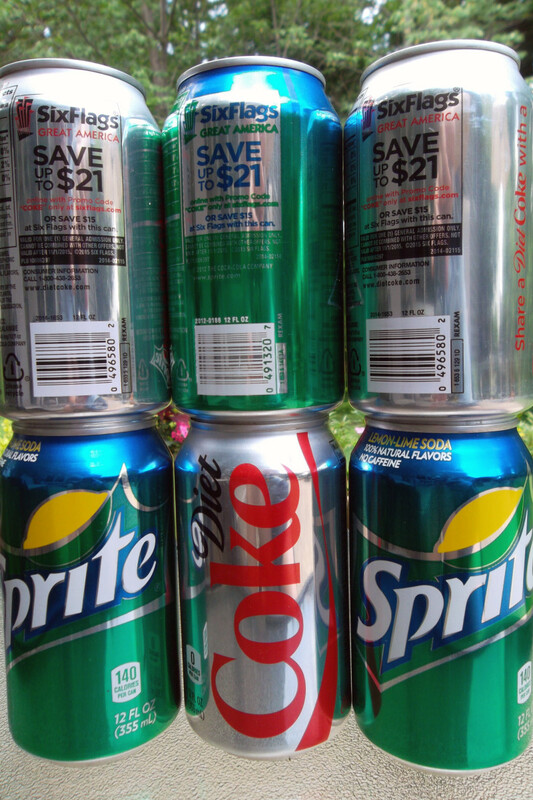 Soda can discounts can vary by theme park, but they usually mean a savings of $15-$21. Be sure to read the restrictions. For example, almost all discounts can only be applied to adult-ticket prices. It is also possible to use the promo code "COKE" at sixflags.com for discounts. Ortega: Most discounts and coupons for Six Flags tickets can only be used for adult admission. 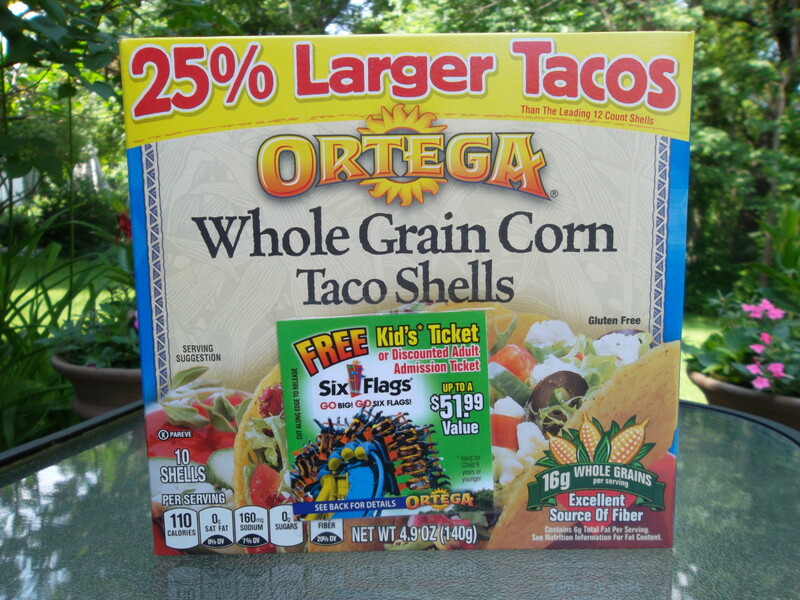 This year, Ortega has a coupon that can be peeled off its taco shell boxes and be used just for kids' tickets. With the coupon, children nine and under get in free on a weekday with the purchase of a full-price general admission ticket. That's a value of up to $51.99. The coupon can also be used for $10 off an adult general admission ticket. Both deals expire September 20, 2015. Wet Ones: Text or email your receipt showing a purchase of Wet Ones hand wipes and receive a coupon good for one free weekday kids' admission with the purchase of a full-price adult general admission ticket. This coupon can also be used to take $10 off a full-price weekend general admission ticket. Other products: Watch for discounts on other food and product packages, as they often pop up throughout the summer months. Here are some from past years: Post Cereal (2012), Polly-O and Kraft string cheese (2011), Tony's frozen pizza (2011). One of the easiest ways to get a discount is to simply purchase your ticket online at sixflags.com at least 24 hours in advance of your visit. 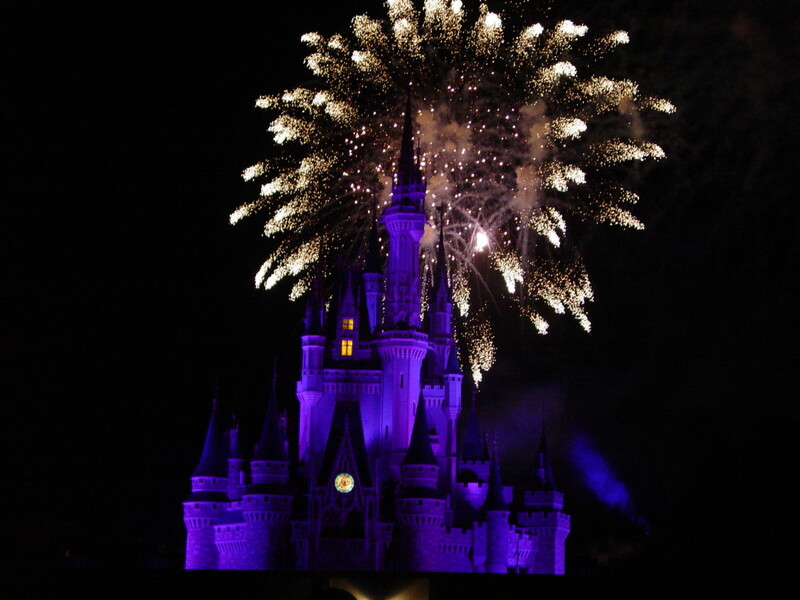 The amount of the savings varies by theme park, but can range from $15-$25 per general admission ticket. For frequent visitors, purchasing a season pass is a must. Not only do season pass holders enjoy significant savings off admission, but the booklet is filled with lots of other valuable coupons. 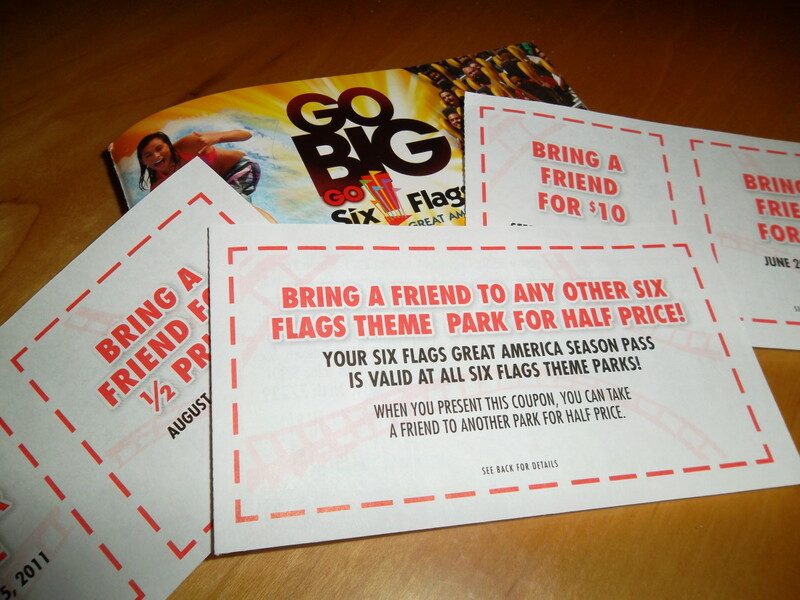 In 2013, for example, the GOLD Six Flags pass includes free parking at every Six Flags location. Other pass books offer significant savings on bringing friends along. Season pass books are cheaper when purchased early in the season or when bought online in multiple numbers. The Summer Thrill Pass costs less than the regular season pass, but does not come with the coupon book and is only valid during the summer season (not for off-season events like Fright Fest). 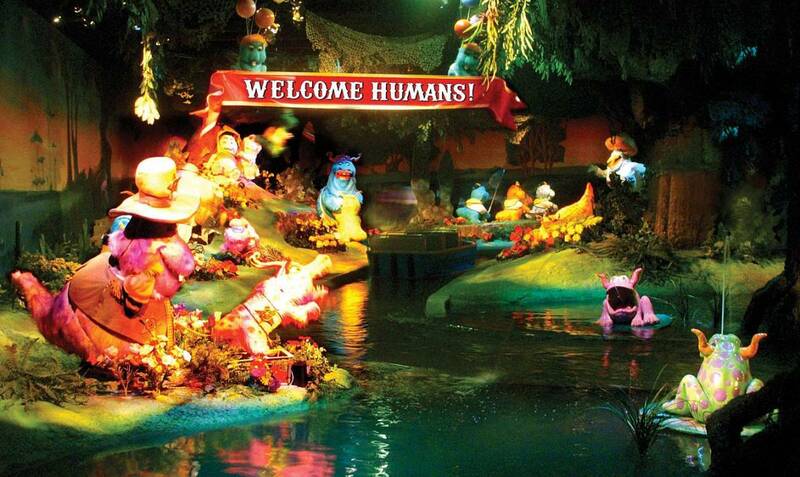 It's tons of fun to spend a day at an amusement park, but it's even more fun when you go with lots of friends! Six Flags offers significant savings to groups. Minimum numbers vary by park, so make sure to find out ahead of time what restrictions apply near you. 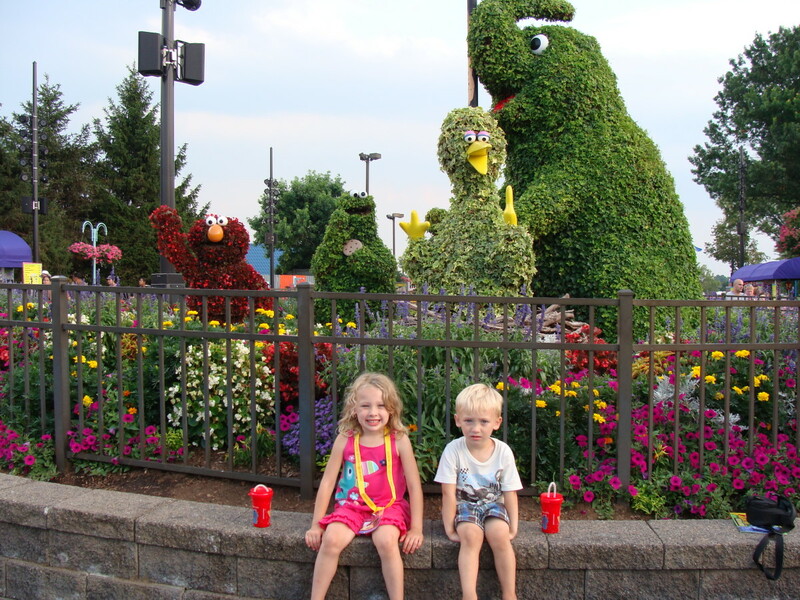 At Great America Chicago/Gurnee, a minimum of 20 is required for discounts. At Six Flags Great Adventure in New Jersey, discounts are available for groups as small as ten. 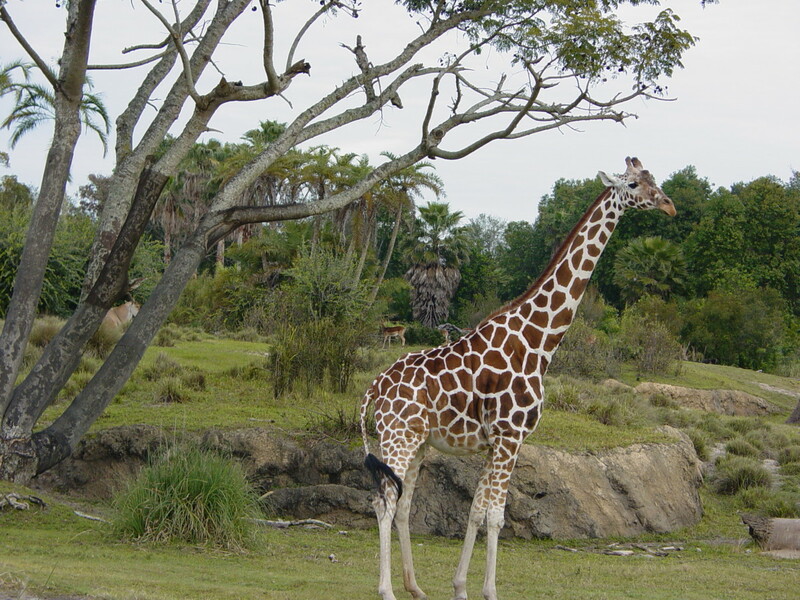 When you go with a large group and purchase tickets in advance, you can receive one free ticket for every 10, 15, or 25 admissions purchased (depending on the location). See the table above for 2019 Six Flags group ticket prices for each theme park. 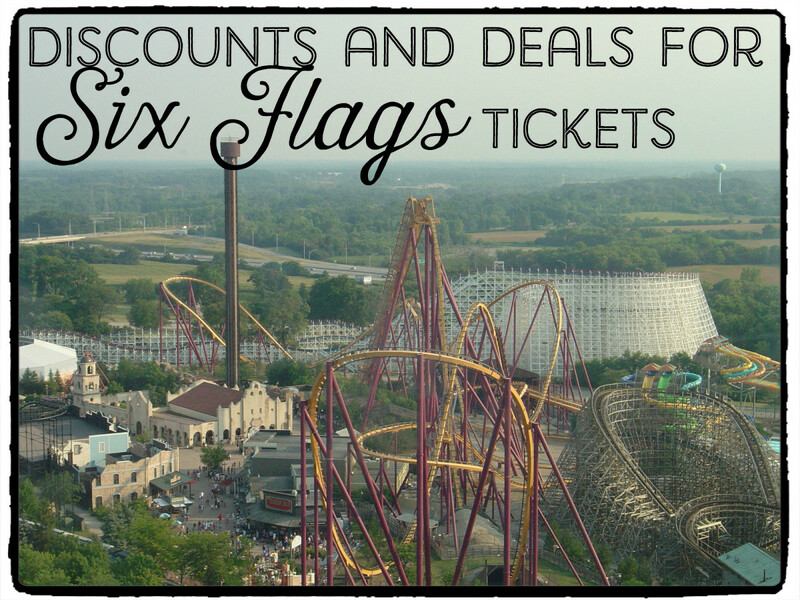 Have you received discounts on tickets to a Six Flags park? No, but I'm going to look into it. Yes and I saved a lot of money! Kroger stores, located in the southeast U.S., sell discounted Six Flags season passes and may sell discounted one-day general admission tickets to both Six Flags parks in Georgia. If visiting a Six Flags park is part of your vacation plans, be sure and ask about ticket packages to the theme park before booking your hotel room. It may be worth paying a little more for a hotel room if it comes with discounted or free theme park tickets and a free shuttle. Plan ahead. 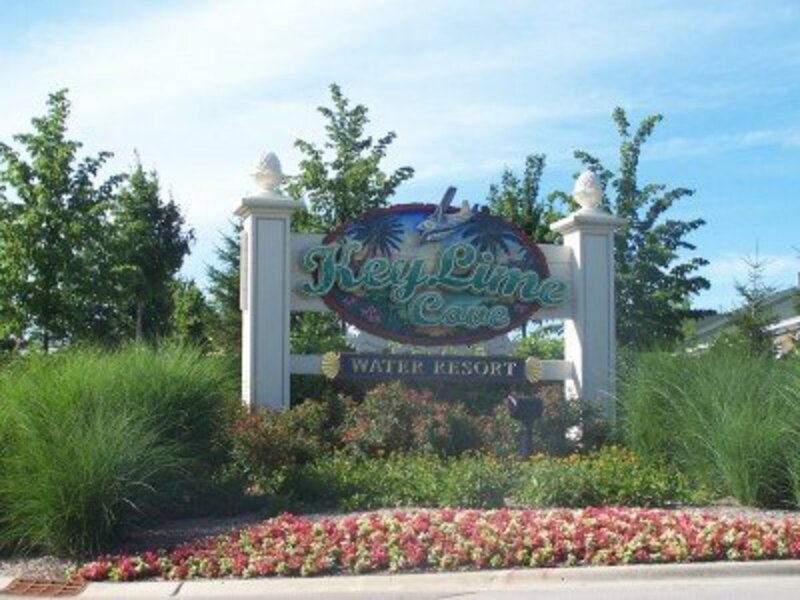 The Ride 'N Slide one or two night package available at Keylime Cove indoor waterpark and resort in Gurnee, IL is worth considering for visitors of Six Flags Great America. Located within a mile of the theme park, the Ride 'N Slide package includes hotel room, admission to Great America and Hurricane Harbor waterpark, admission to Keylime Cove's indoor waterpark, and a free shuttle. 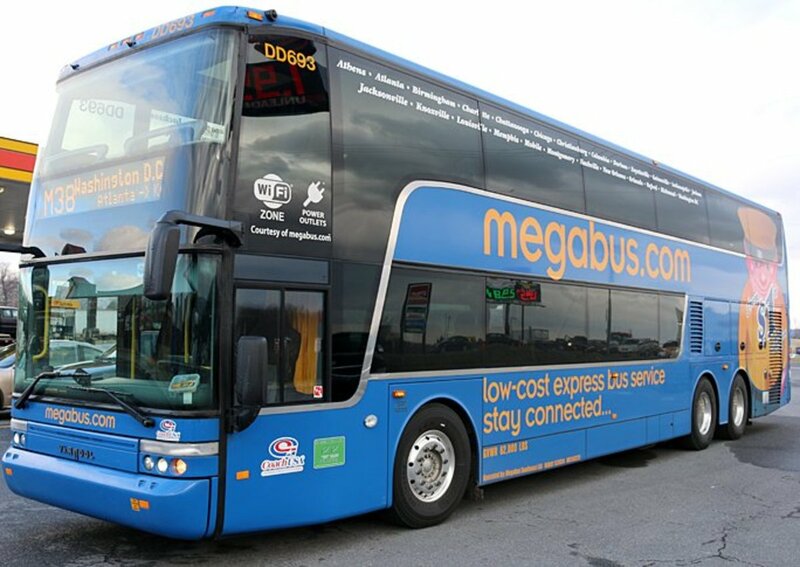 Hotels near Six Flags parks may also offer deals. The Comfort Inn near Great America Gurnee/Chicago sells a Great American Six Flags package. Ask about hotel and park admission discounts. Companies and businesses located near Six Flags amusement parks may give their employees discounted admission tickets. Reduced-priced tickets also can often can be purchased at local credit unions. Six Flags has a reading club, Read to Succeed, designed to encourage children in grades kindergarten through sixth grade to read. 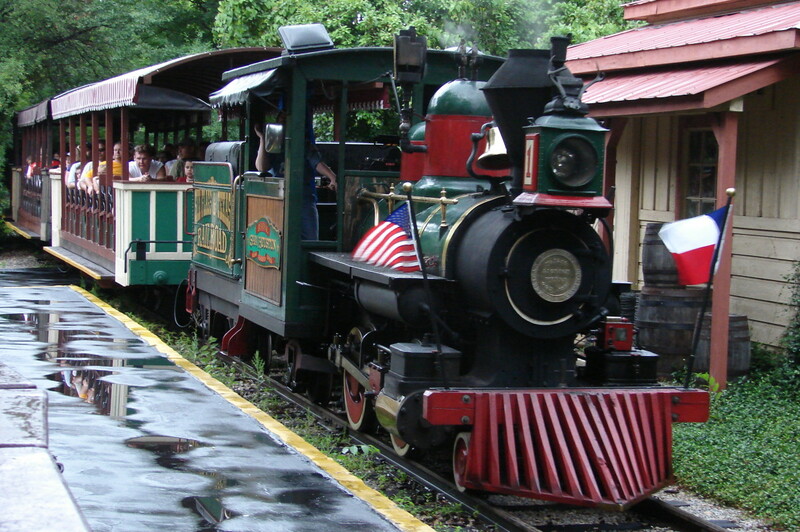 Students who complete six hours of recreational reading earn a free admission ticket to a participating Six Flags park. Teachers can earn free tickets, too. Teachers with ten or more students participating in the program are eligible for a free ticket. The school must be within a 250-mile radius of a Six Flags theme park. If you use your Discover credit card to purchase Six Flags tickets or passes (either online or at the main gate) you will receive a 5% discount. This same discount is also available for all purchases made within the theme park. Share Your Six Flags Experience! If you have had good luck getting discounts for Six Flags park tickets, share your experience below! Or, if you've had trouble with any of these, or other, ways to save money at Six Flags, let us know that too. You may help another amusement park lover save some money. Thank you very much for your helpful tips. I wanted to buy a ticket for the water park in Los Angeles with my discover card, but I can't use 5% off on the purchase. What should I do to use it? I being taking my Son every year for his birthday since he was 13 years! Sadly This year will be the last time due to him turning his famous 21st. Hopefully he will keep going because He LOVES, LOVES, LOVES Six Flags. If you are a pass holder, do you get a discount on daily tickets bought for a friend, even if it is not a "bring a fring for free" day? This was a great hub. I used to go to Six Flags in NJ, when I lived in NJ. 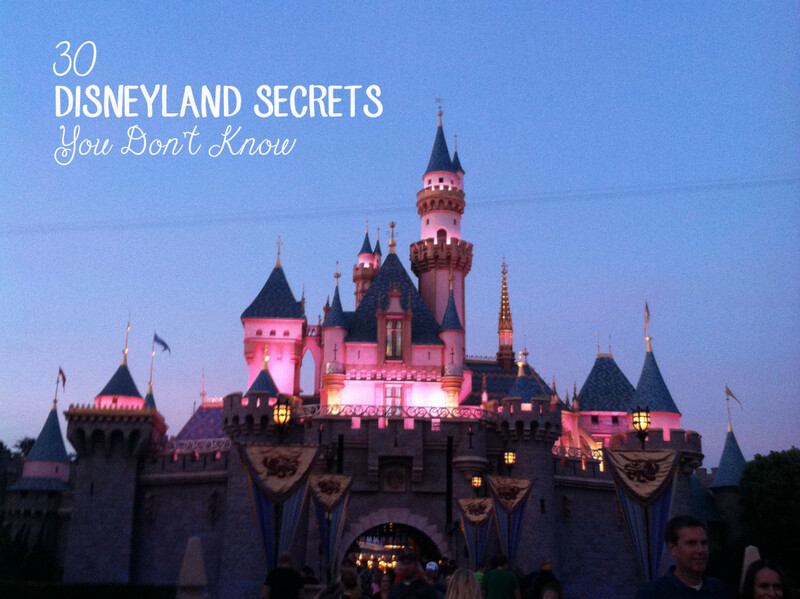 Great tips that could apply to Six Flags or any theme park. Voted up for useful! Great list! I knew some of them, but I didn't realize there were so many ways. You should never pay full price at Six Flags. Most corporate McDonalds stores (at least in MA) have a coupon for Six Flags that's 2 dollars off! You can often find individual Coke cans in the coolers at convenience stores and gas stations. Also, the cans inside the multi-packs of Coke are usually printed with the Six Flags coupons, even though it is not indicated on the box/carton itself. This is Really a Gem right here Sister! Can you give a discount code to save money on Six Flags New England? Thanks! I know in the Chicago area, I've seen them on the cans of Coke in 12-packs and on single cans that you might buy in a restaurant. The cans in the case aren't visible and it does not say anything on the box. I can't find any coke cans with that coupon on it and we're going this week! lilredsaver - Thanks for letting me know that. It's good to know that these tips allowed you to work Six Flags into your vacation plans. By the way, if you go to a Six Flags with a water park (i.e. Hurricane Harbor) the admission ticket is good for both the amusement park and water park. Have Fun! Thanks so much for the tips! My husband and I were just talking about maybe including Six Flags in our vacation plans...and these money-saving tips have sealed the deal!! Thanks kashmir56. Amusement parks can be quite expensive so every little bit helps. Most of listed discounts are significant enough to add up to a good amount of money saved. Your comment and vote are appreciated. 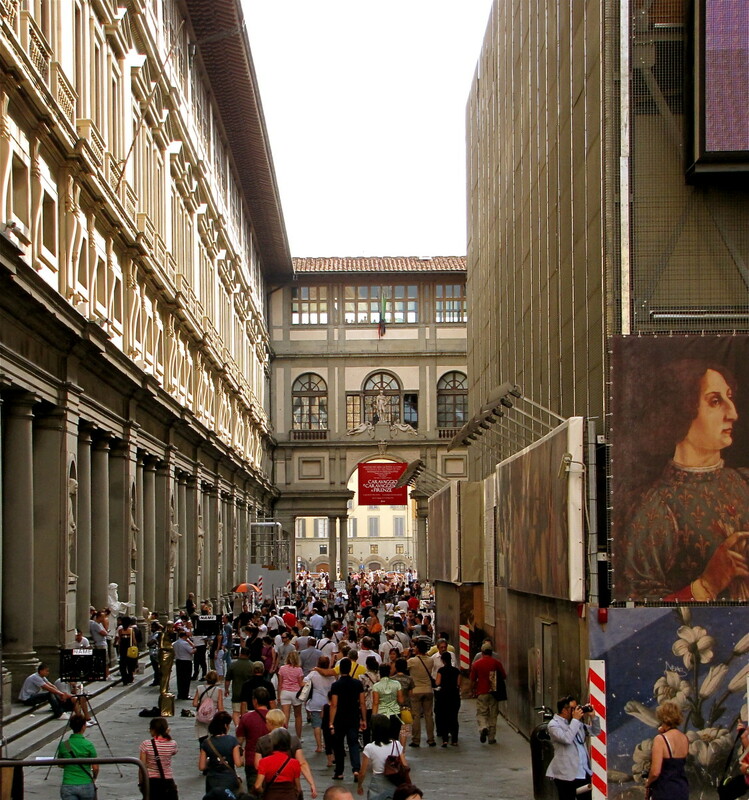 All great information to help everyone going there this summer to save money. Well done! tipstoretireearly - And just in time for summer savings! I cannot even imagine paying full-price at the gate.